Katy Perry used her Grammy performance yesterday to shed some celebrity light on domestic violence and abusive relationships. From opening her Super Bowl half time show with Roar, the singer slowed it down and brought it home with a powerful rendition of “By the Grace of God” preceeded by a special guest, Brooke Axtell, a domestic violence survivor. To show how serious DV is, President Obama actually gave a statement before the double act, about how influential artists can be to helping encourage victims of domestic abuse get help and change thinking. “Artist have a unique power to change minds and attitudes,” the President said. “It's an honor to collaborate with Katy in this way. She has been very devoted to various aspects of female empowerment. It's going to bring a lot of encouragement and freedom to those who hear my story and know that they are not alone in this." 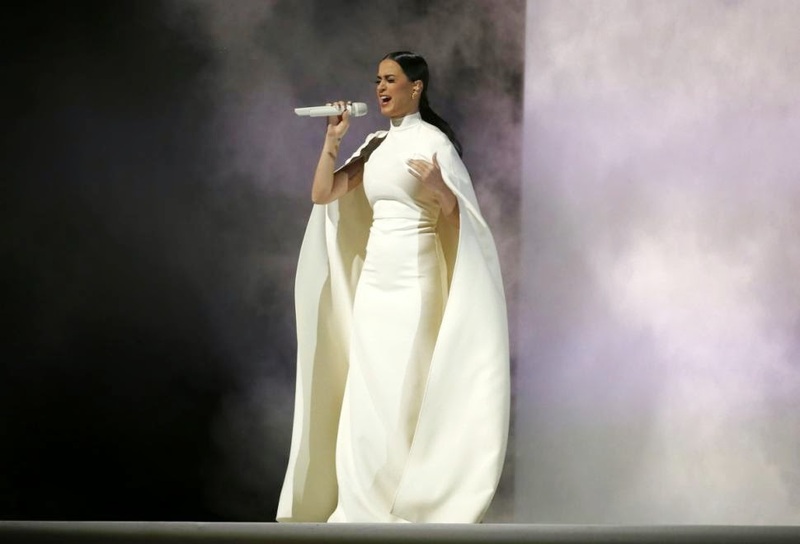 After Axtell shared her story about her dangerous past relationship, Perry, 30, took the stage in front of a white screen wearing an all-white dress with what appeared to be her shadow behind her. As she began to sing the shadow proved to be several dancers who were performing behind the white screen. Axtell advocates for survivors of domestic violence, sexual assault and human trafficking, and she pulls from her own experience in hopes of inspiring others.